An unlucky race in Korea - when will the team's luck change? Vijay Mallya: It was a very difficult race and we certainly didn't get the reward our race pace deserved. We are making small steps forward on the one-lap pace and working hard to recapture the race pace we showed earlier in the season. Unfortunately, we can't convert our performance into points. In Korea we could have had one or two cars in the battle for points that developed at the end of the race. With five races still to run, what are your expectations for the rest of the season? VM: The final five races offer some very different challenges. Some tracks will suit us more than others, but it's vital that we get back to scoring regular points to secure our position in the championship. Suzuka is a big challenge for us, but it's important we keep our heads up and try to put the disappointment of Korea behind us. More names in the driver market are falling into place. When are we likely to hear something about the team's 2014 plans? VM: We are considering all available options and we never take these decisions in haste. We have a competitive pairing at the moment, but we will sit down with the team management and discuss the way forward for next year. It's unlikely we will make any decisions before the Indian Grand Prix in any case. Paul, you've been to Japan several times, do you enjoy visiting? Paul Di Resta: It's definitely an interesting country to visit and a great place to go racing with a lot of passion and history. It's in Japan that we meet some of the most dedicated fans in Formula One because the grandstands are always full - even on a Thursday! Tell us about the track? PdiR: It's one of the best tracks we race on. For me it's up there with Silverstone because it demands so much from the car. Running on low fuel for a qualifying lap is a great feeling and something I look forward to. It's also a big technical challenge in terms of optimising the set-up and it's very tough on tyres because of the high-speed corners. How do you think the team will perform there? PdiR: It's impossible to say at the moment. All we can do is go there and concentrate on optimising the car balance. We've been focussing more on race performance recently and hopefully that will pay off. Adrian, you used to live in Japan - do you look forward to going back? 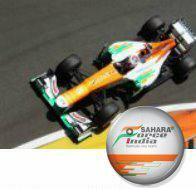 Adrian Sutil: I have good memories of Japan. When I was 23 years old I lived there for a year and I enjoyed it so much I didn't want to leave! The fans are very passionate, friendly and respectful, and they always give me a lot of energy. I love Japanese food too, especially Teppanyaki, and there is so much variety. What about Suzuka? Can you think of a more challenging circuit? AS: I would say Suzuka is one of my favourite tracks along with Spa. The difference is that Suzuka is more technical than Spa because it's narrow and quite bumpy, so I think having more experience of Suzuka can help you make the difference. Because I raced in Japanese Formula Three, I have driven so many laps of this track and I probably know it a little better than some other drivers. What's the secret to a quick lap at Suzuka? AS: You need a car that works well in the high-speed corners. The ‘S' curves at the start of the lap are beautiful because you can really feel the performance of a Formula One car and the incredible grip you have available. You need to have a car that allows you to find the right flow and rhythm through these corners because you can make up or lose a lot of time through this part of the lap.